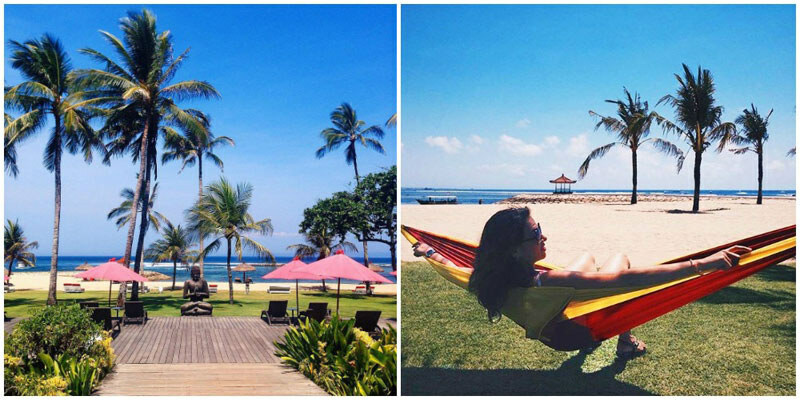 What makes Bali’s luxury beach resorts so alluring? Is it the impeccable service, the world-class architectural design, or the elegant rooms with beds fit for royalty and fancy pants bathroom amenities? 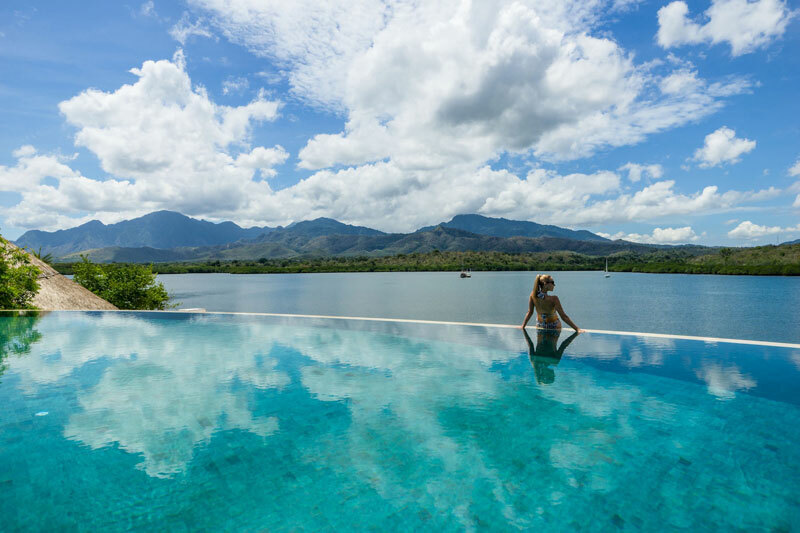 Egyptian cotton sheets and fluffy bathrobes are aemll rather wonderful, but it’s an eye-poppingly amazing pool that really lets you know you’re in high-priced paradise. If you wouldn’t mind kicking back celebrity style in an extravagant 5 star resort pool, but don’t have the budget or the burning desire to actually stay in such exclusive digs – well, you’re in luck. Many resorts offer day passes for non-residents, giving you access to the pool, and often other amenities as well. 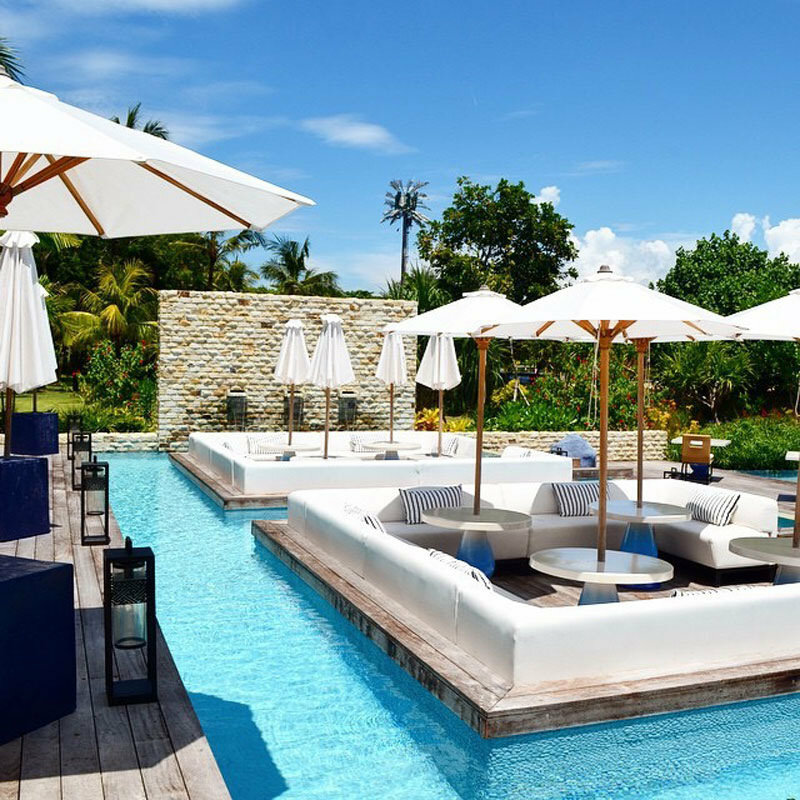 We’ve dipped our toes in at 9 of Bali’s top-end resorts to show you the best places to soak up their poolside luxury for a day. 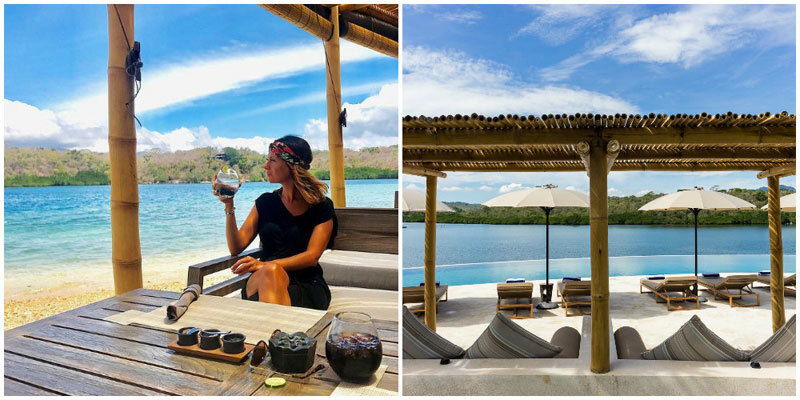 In the midst of dry land and wilderness of Northwest Bali lies Menjangan Dynasty Resort, a slice of water paradise where luxurious glamping meets thrilling watersports. 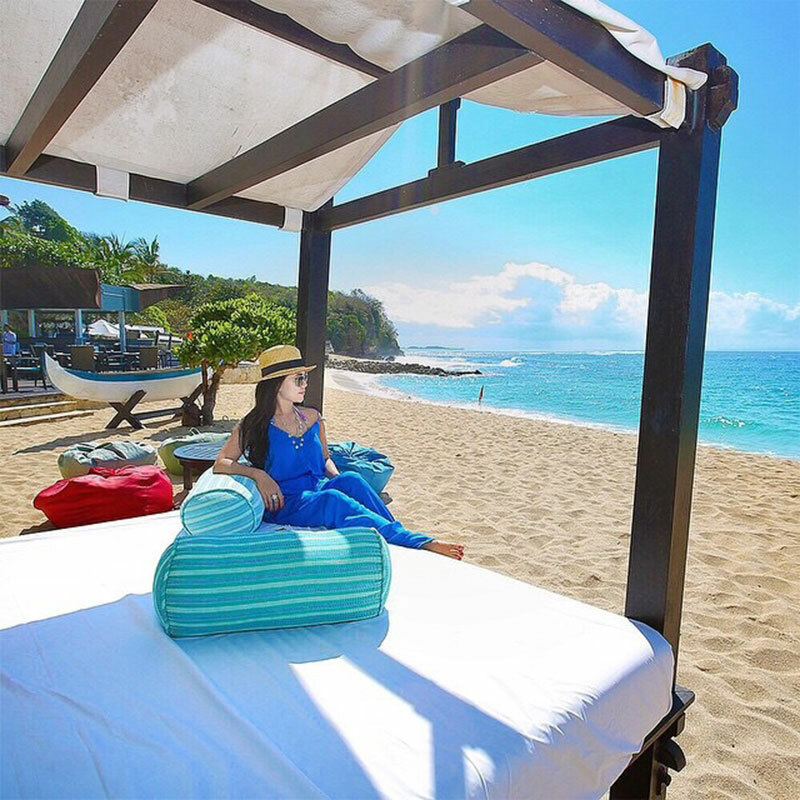 In fact, glamping is an understatement as you get to relax in luxuriously fitted-out tents, sumptuous bedding, the beautiful ocean breeze and the gentle views of Banyuwedang Bay. Don’t miss the watersports here, which is not just way beyond your usual local providers’ standard, but also comes with a professional instructor and proper equipment. 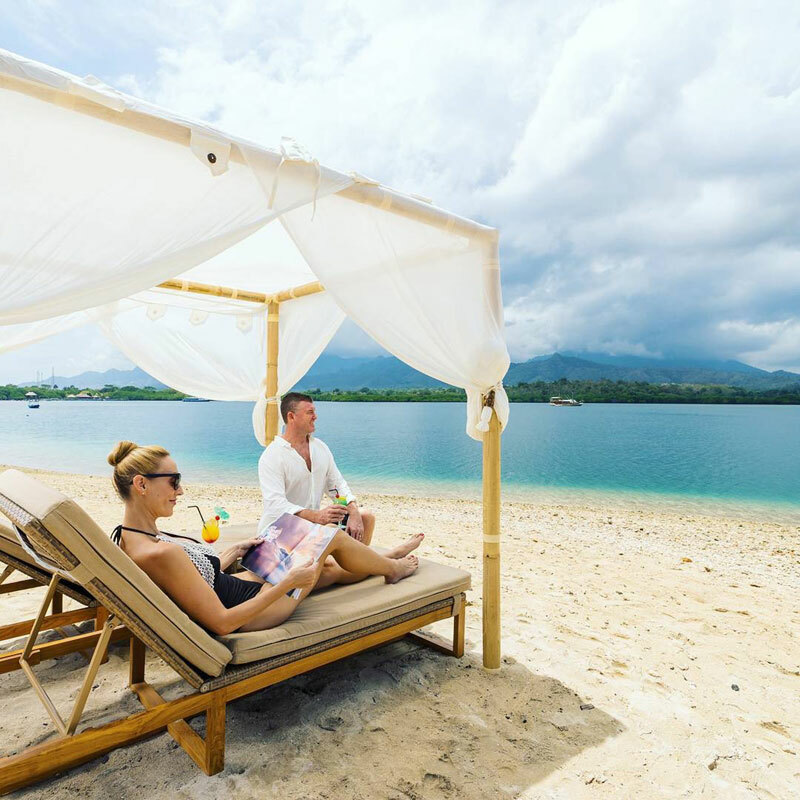 If you aren’t a resort guest, Pasir Putih Day Pass allows you access to the resort’s impressive beach club, which is in essence a restaurant and bar with a sustainable bamboo architecture. 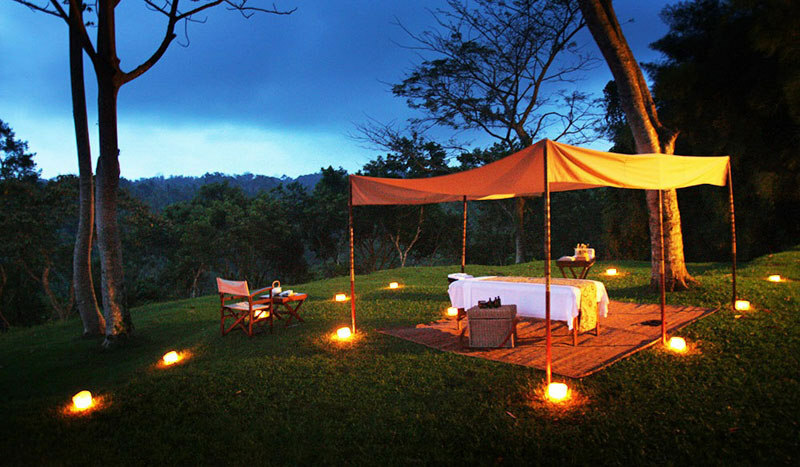 Step barefoot into the shady retreats where cosy cabanas and the natural-finish open bar are. You can also pick a beanbag seat on the white sandy beach out front with chill music and blissful vibe all around. 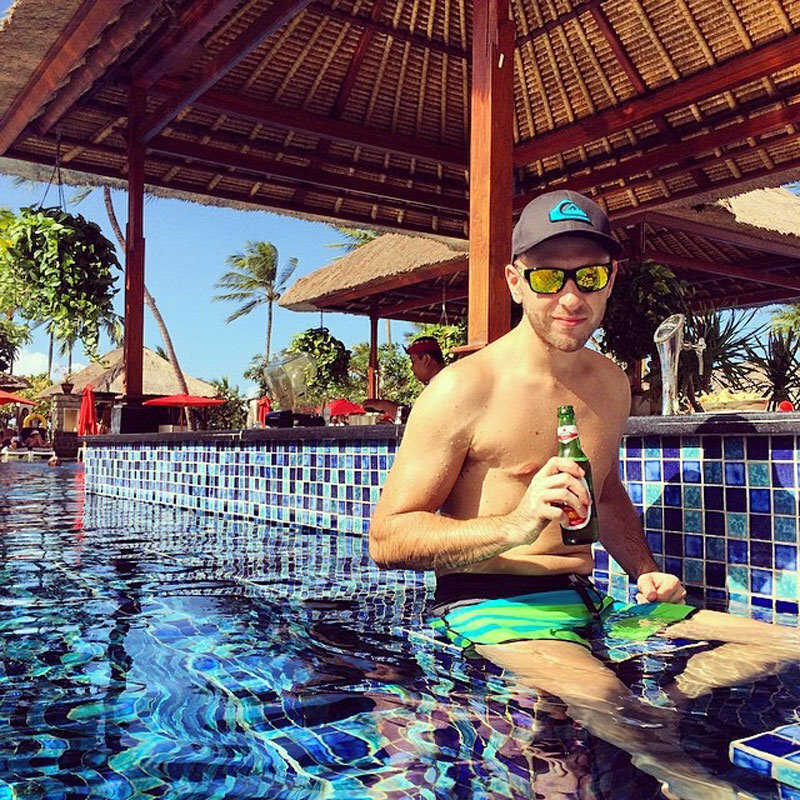 Next to the bar is an oceanfront pool, surrounded by lovely sunbeds on which you can lounge around in all day, while you sip the delicious Menjangan Margarita or nibble on other beachside delights. 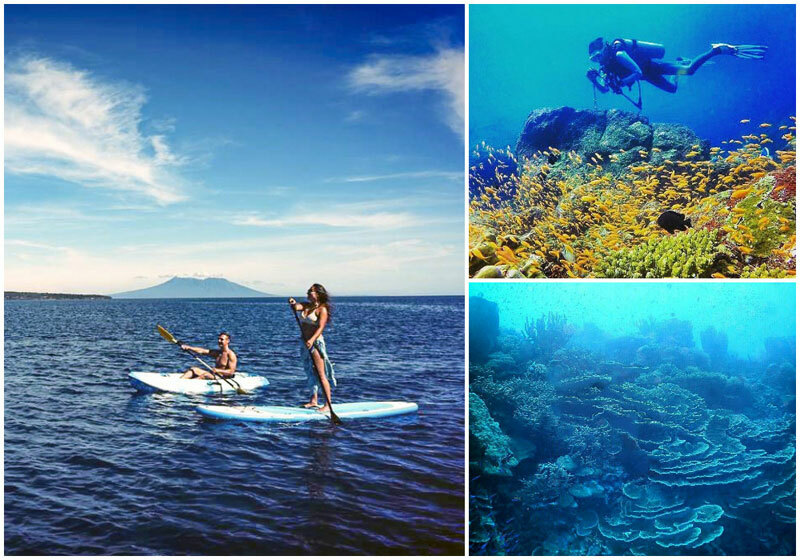 When you’re all geared up and energised, do go snorkelling, diving, stand-up paddleboarding and kayaking in the ocean! 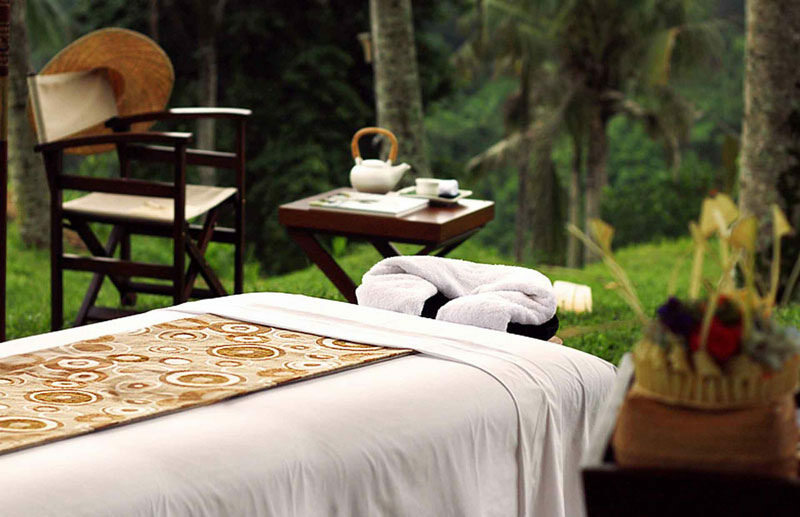 You can also check out the signature Pasir Putih spa treatment. With the glamping theme, your luxurious massage will take place in a private and semi-alfresco terrace with a view overlooking the white bay. 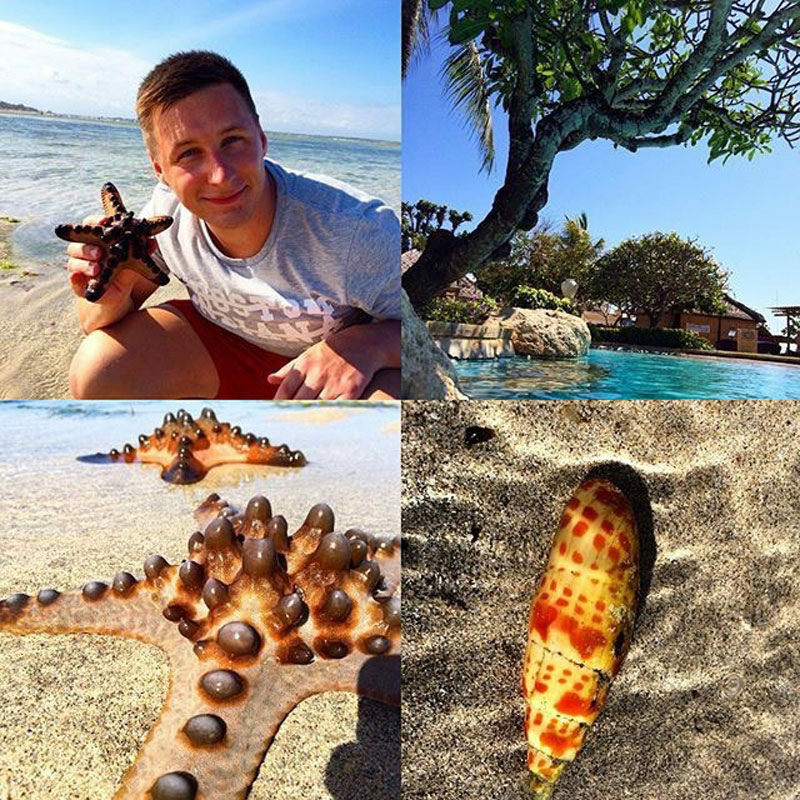 So treat yourself to a day where you can relax in comfort, experience the lovely ocean and reconnect with nature. Pasir Putih Day Pass costs Rp. 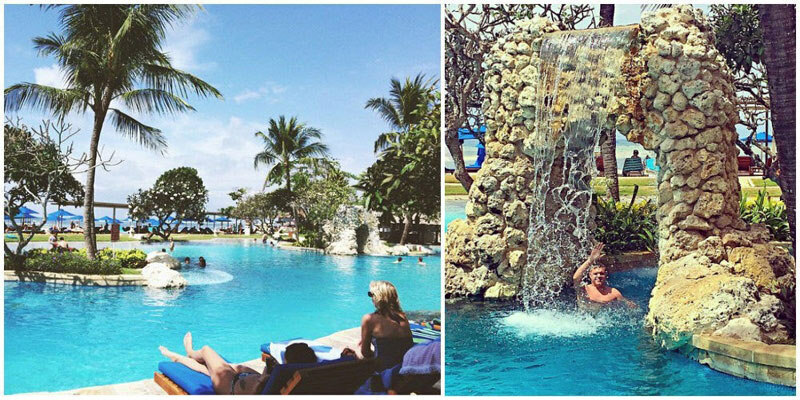 250,000 (approximately USD 19) to use the beach club plunge pool and it comes with Rp. 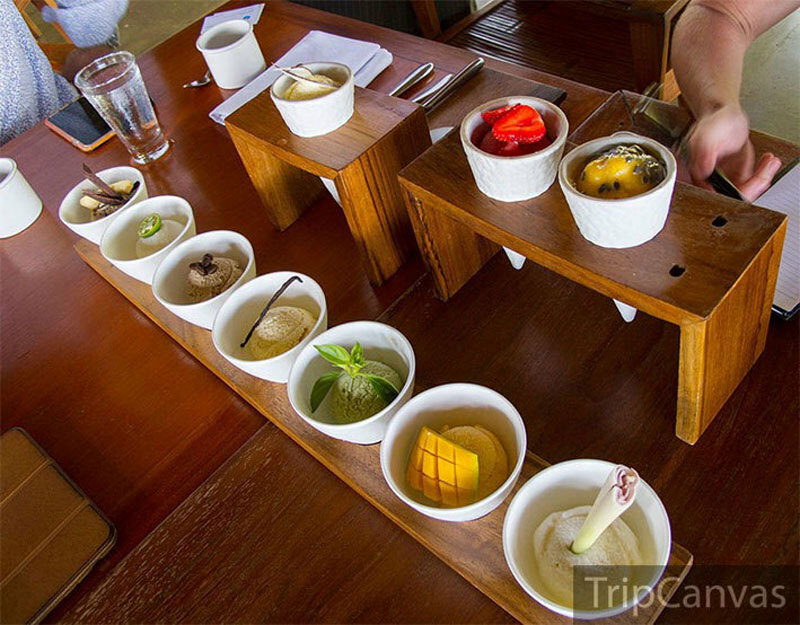 200,000 (approximately USD 15) credits for food and drink per person. Includes free shuttle bus transfer from Pemuteran area. Call ahead of time for arrangement. 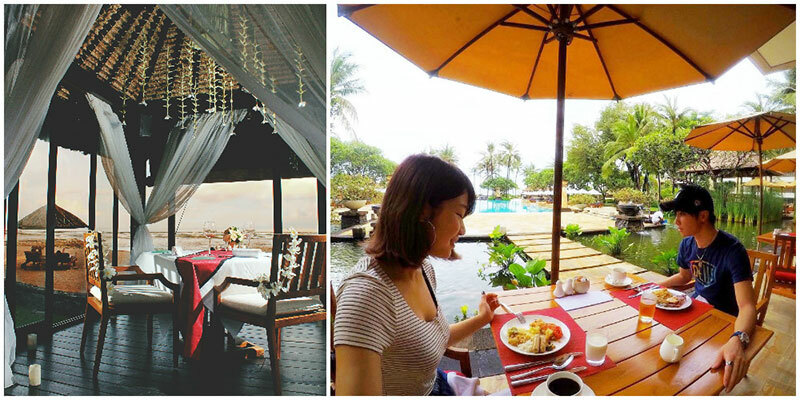 Also: Read about our review on stay & experiences at Menjangan Dynasty Resort! 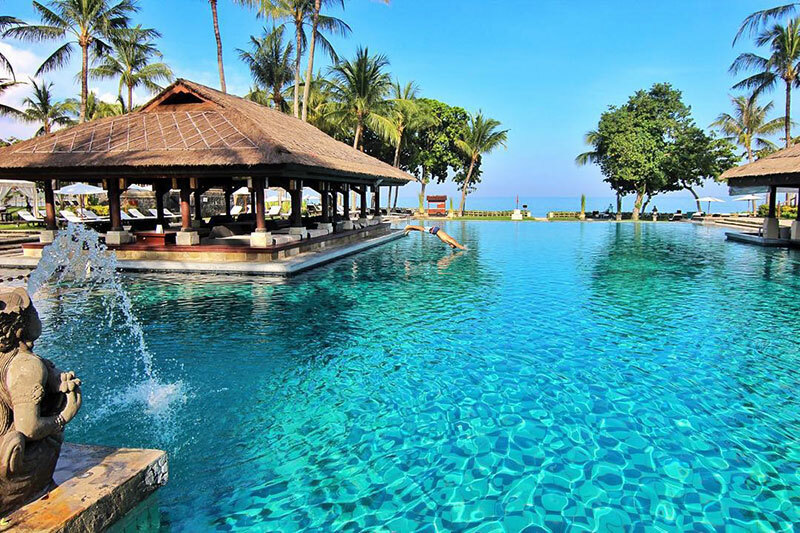 The InterContinental Bali Resort boasts not just one, but five swimming pools (plus one private Club Pool for guests) spread across acres of magnificently landscaped gardens. The stunning Main Pool at 35m long never gets too crowded, surrounded by a garden-fringed terrace lined with plenty of sun beds, and of course the ever-handy Pool Bar at the water’s edge. 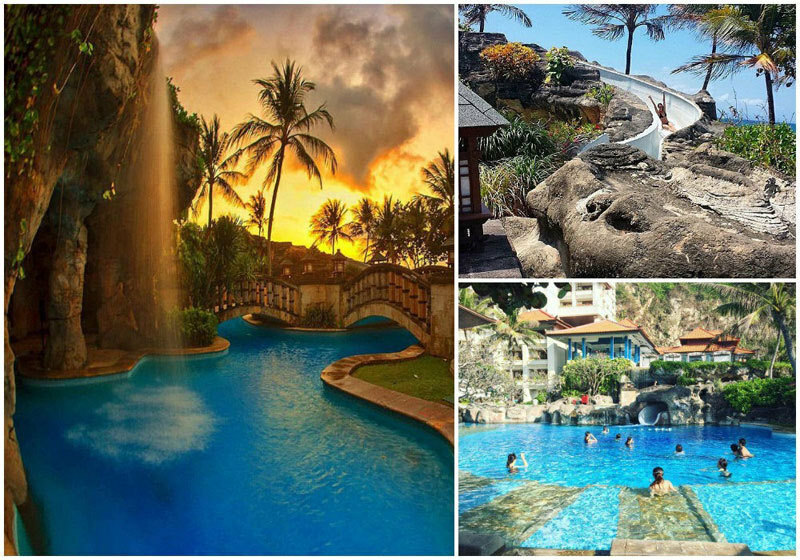 There’s also the secluded Balinese Bath Pool with its sculpted stone walls and water spouts, a traditional Balinese inspired Fountain Pool and two supervised kids’ Fun Pools. If you do make your way down to InterContinental Bali Resort, treat yourselves to great food at the in-house restaurants – from the award-winning KO Japanese Restaurant, to Italian fine-dining at Bella Cucina, and fresh seafood off the extensive menu at Jimbaran Gardens. Naturally, hit up Sunset Beach Bar & Grill for pitchers of sangria, cocktails and beer; and while you’re there, don’t miss out on The Gelato Counter’s chillingly good gelato. Tip: The staff recommend calling up ahead of time, but walk-ins are usually accepted. Guest passes can be purchased from the leisure concierge in the lobby. 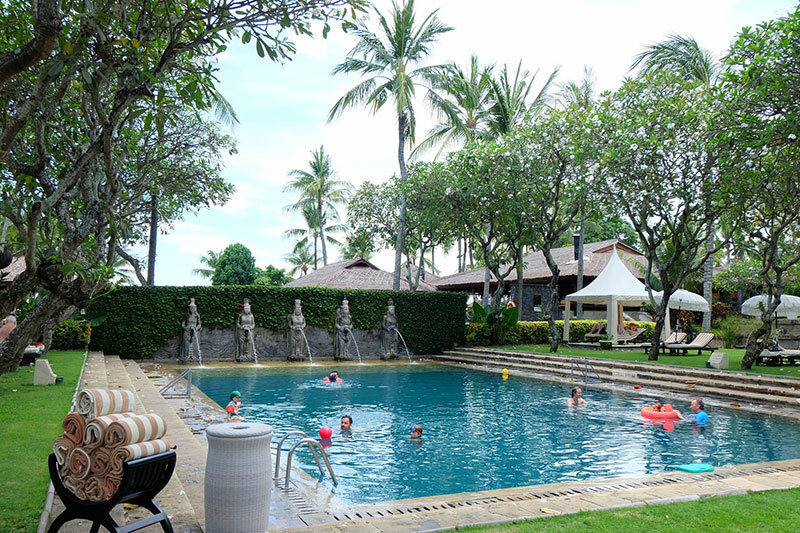 A Pool Pass for the day is Rp500,000++ (approximately USD $37++) for adults, from 6am to 7pm. This includes Rp. 250,000 (approximately USD 19) credit for food & beverage or spa / beauty salon. A Pool Pass for children (3-12 years old) cost Rp. 250,000++ per child (approximately USD 19). This includes Rp. 150,000 (approximately USD 11) credit for food & beverage or spa / beauty salon. Free of charge for children below 3 years old. Pool Pass also includes a towel, sun lounger and/or umbrella and/or hut for a day (subject to availability), access to shower and locker, tennis court (subject to availability), spa facilities and fitness centre (adults only) and access to main pool, Balinese bath pool, fun pool and fountain pool. 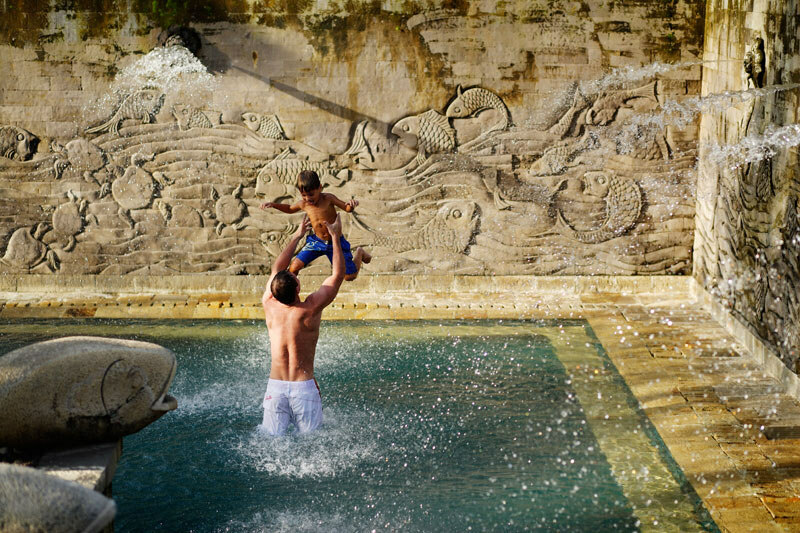 The Sundara is Jimbaran’s most famous playground for the rich, the famous and the pleasure-seeking. 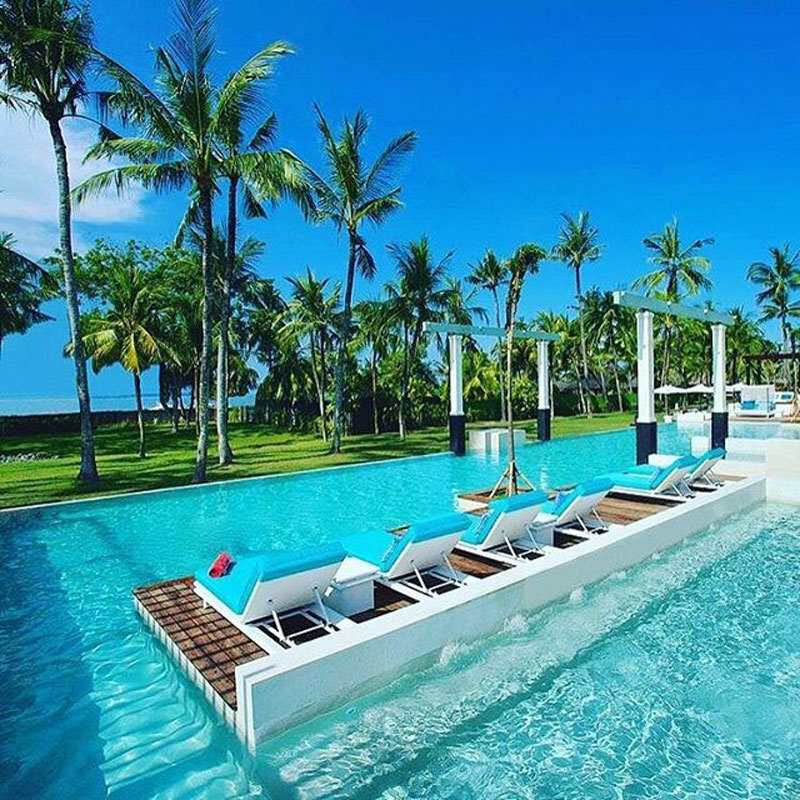 A sultry beach club and home to one of Bali’s best restaurants, it also plays host to a world-class spa and the longest beachfront infinity pool on the island at an epic 57m. 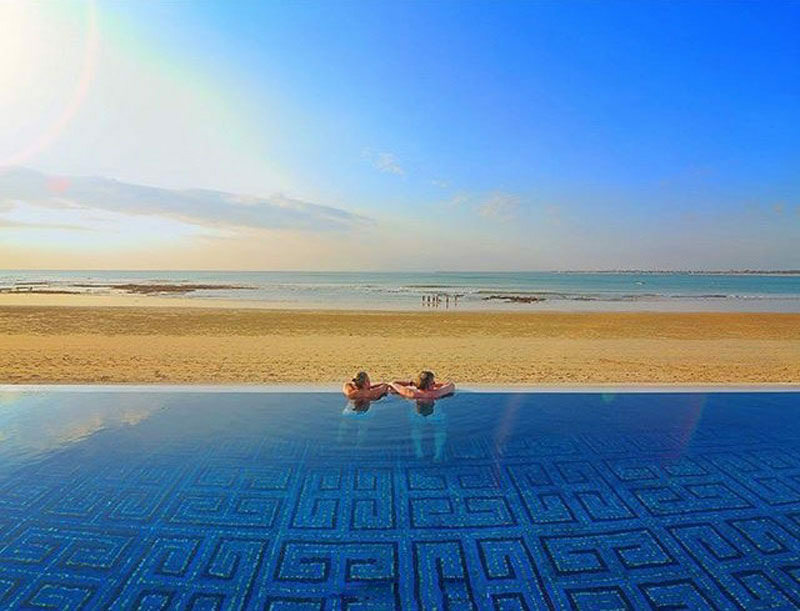 The pool runs right alongside the beach with just a sliver of sand between them. Day guests and their families are welcome to dine in the beachfront bar/restaurant, drop the kids off at the Jimba Kids Club (Rp. 80,000++/day for kids above 4 years old and Rp. 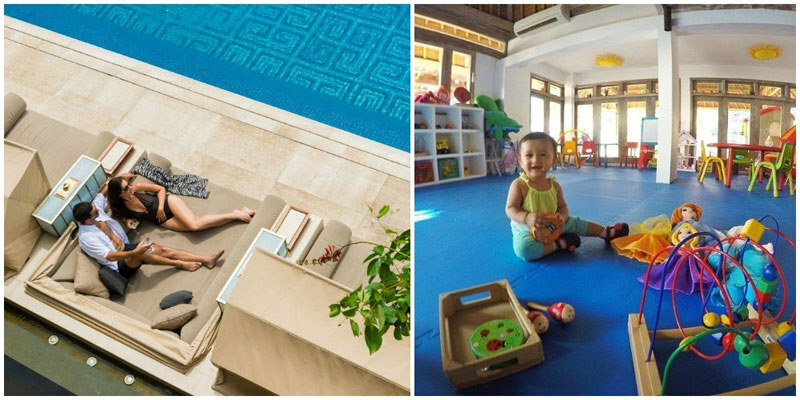 50,000++/hour for kids below 4 years old – Including Kids Club nanny), and make use of the pool and day beds for a fee. Sundara’s chic and spacious double day beds are stretched out along the pool overlooking the spectacular curve of Jimbaran Bay. Be sure to call and book your daybeds in advance. After a few lazy laps, stick around for mind-melting sunsets and live music entertainment from Bali’s top indie artist. 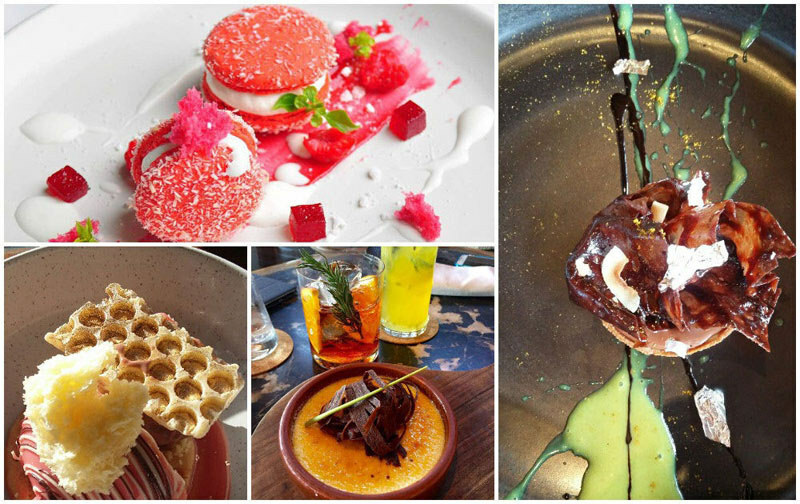 Ps: Did you know that Sundara is top on our list of best places to find dessert in Bali? Known for the exquisite desserts created by their chef, and his penchant for creating whimsically inspired treats – they’re guaranteed to satisfy your sweet tooth! This includes Rp 600,000 (approximately USD $44) credit for food and beverages, poolside service, a complimentary fruit platter, and free Wi-Fi. 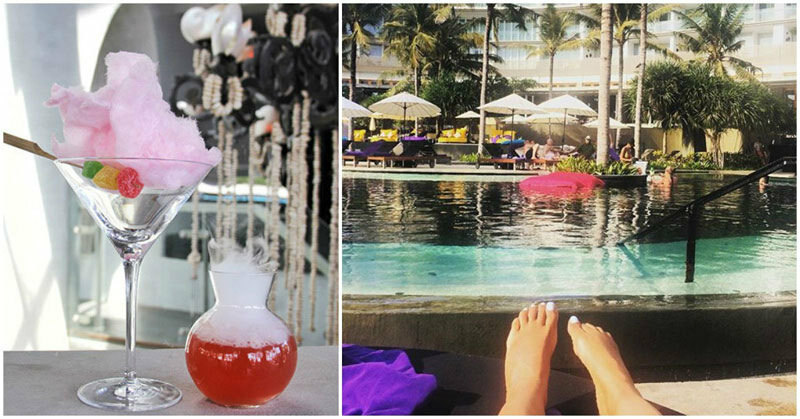 Bold, beautiful and dripping with bling, Seminyak’s hippest hotel is magnet for the well-heeled and glamorous. The location is smack bang on the sands of Seminyak, but the most impressive water view here is the incredible three-tiered pool inspired by Bali’s terraced rice paddies. Spanning over 1,790sqm, surrounded by lush tropical palms and sundecks, it’s the setting for glorious sunsets and W’s sizzling music and fashion events. Day trippers can visit the W’s pool free of charge and without any minimum spend, however it’s expected that you purchase in-house drinks and food if you’d like to use the facilities. The Woobar is the W’s poolside bar where you can grab a cocktail and have a little refresher. The sun lounges and chairs around the pool are reserved for in-house guests, but you can always sink into a sofa at the Woobar to enjoy the tropical vibes and resident DJ beats. Do call in advance to book a sofa at the Woobar. The in-house DJs can usually be found sending out chill vibes from 1pm until late. 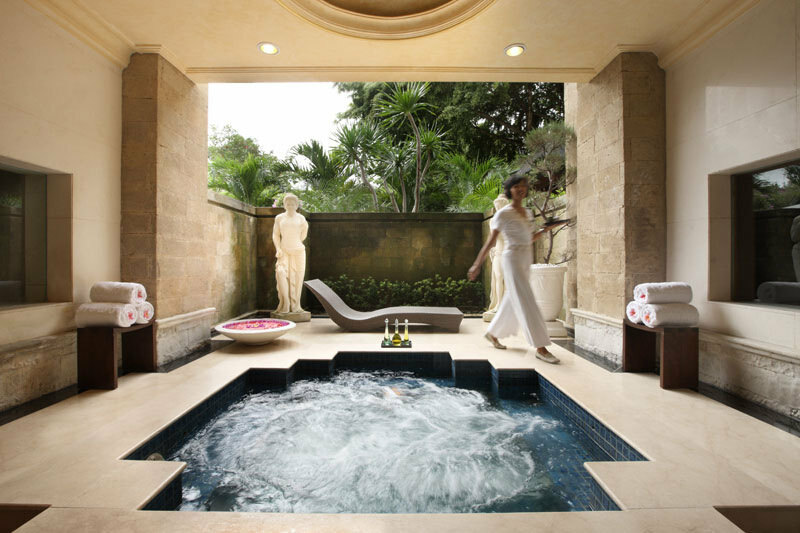 Pampering is the name of the game at Conrad Bali, and the luxury isn’t just for hotel guests. We’re sure your first stop will be the pool, and we don’t blame you. 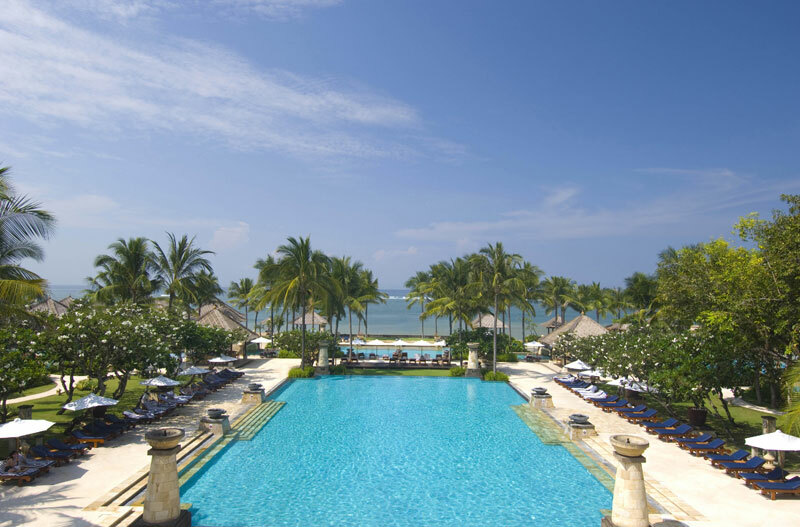 After all, the only thing better than a massive pool is Conrad Bali’s massive oceanfront pool! You can simply lounge the day away in the pool and watch the sun set over the sea. Thanks to its size, it won’t feel overcrowded even on a busy day. After your swim, don’t forget to check out the wide variety of other amenities that are open to non-hotel guests every day from 9am to 6pm. Be sure to book before noon the day before in order to get your spot! 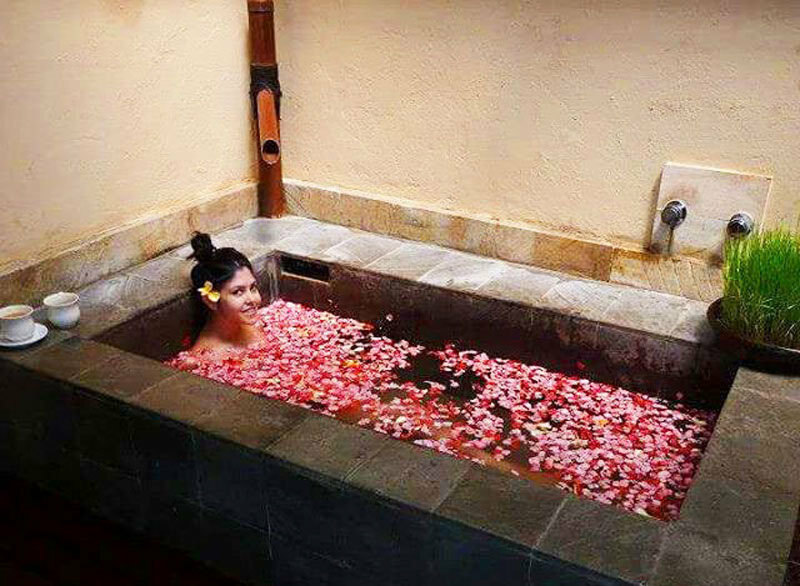 If you are a spa lover, don’t miss out on the utter bliss that awaits you once you step through the doors of Jiwa Spa. 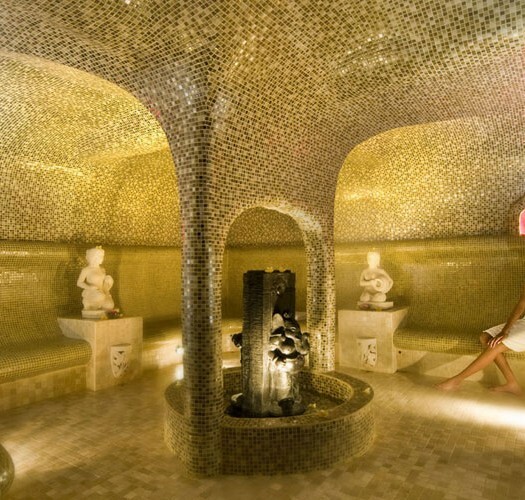 From full body scrubs, hydro therapy massages to reflexology, you will be spoilt for choice. 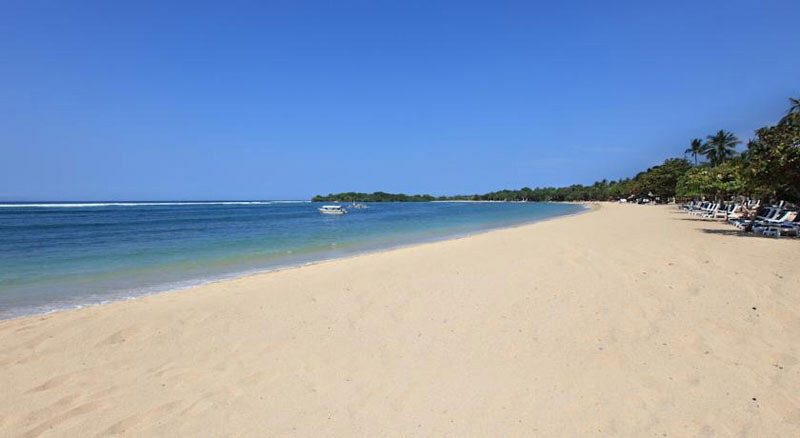 After your massage, simply head out to the beach (you have direct access!) and dip your toes in the sand. Or chill under a sun umbrella with a cocktail! Need to stretch your muscles? Visit the Fitness Centre for the ultimate workout package, which includes pilates, yoga, gym workout equipment, and a wide range of exciting beachfront activities. Windsurfing, anyone? Day Pass to use the pool costs Rp. 300,000 per adult and Rp. 150,000 per child (5-12 years). Children aged 5 and under can use for free. Regular family policy applies to Kids Club and children’s meal benefits. 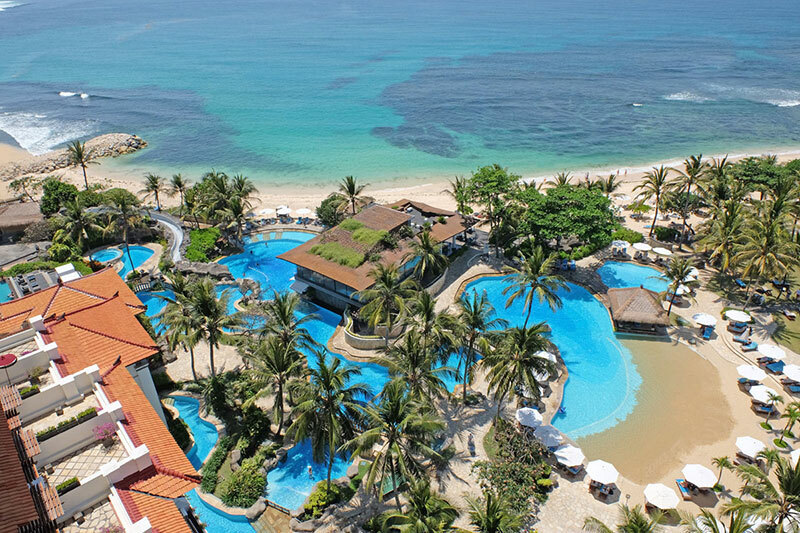 Club Med is synonymous with family fun, and their beachfront Nusa Dua arm is true to their philosophy, with an added sprinkling of Balinese style and hospitality. The resort sits on 24 acres of manicured gardens, dotted with tropical palms and day beds, meandering down to the water’s edge. 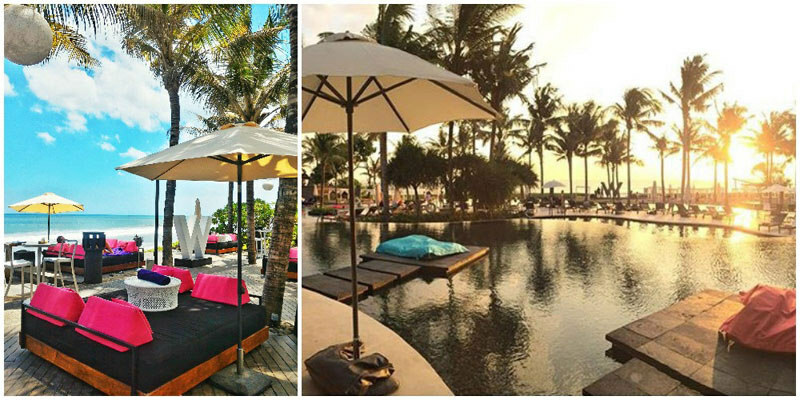 There’s a huge, sparkling main pool with boardwalks, lounge decks, the Kintamani Pool Bar and the enormous Agung Restaurant right in the middle of the pool, serving delicious dishes and colourful cocktails alfresco on the pool deck. Club Med specialises in treating day guests to the same level of service, so you won’t find like an outsider or an impostor. There are two passes available, a Day Pass from 10am to 6pm, and a Night Pass from 6pm to midnight. 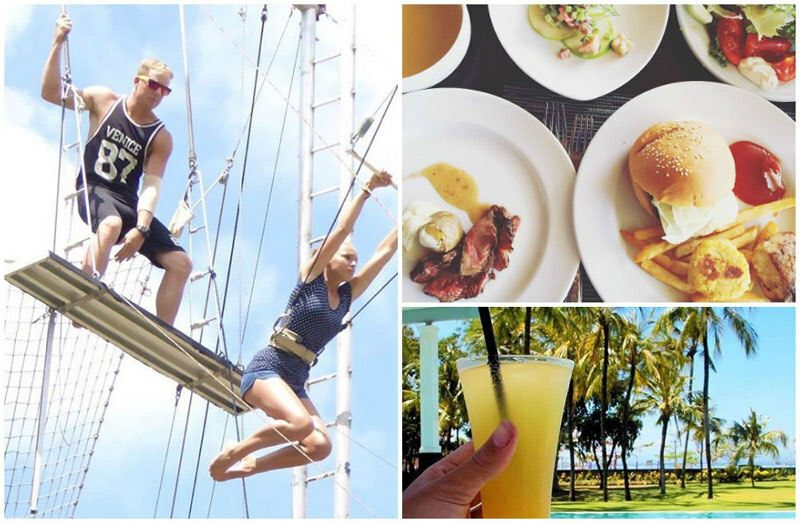 The day pass includes lunch and drinks at the bar and gives you the opportunity to discover activities such as yoga, trapeze, windsurfing and tennis. The night pass includes dinner and drinks at the bar accompanied by live entertainment. Tip: Club Med’s day passes are extremely popular, so be sure to book at least 24 hours in advance. A Day Pass costs Rp 876,300 (approximately USD $65), and is valid from 10am to 6pm, Mondays to Thursdays only. A Night Pass costs Rp 1,216,000 (approximately USD $90), and is valid from 6pm to midnight (Mondays to Thursdays). An Afternoon Pass costs Rp 450,000 (approximately USD $33), and is valid from 2.30pm to 6pm, Mondays to Thursdays only. A Full Day Pass will cost Rp1,690,000 (approximately USD 125), from 10am to 12am. 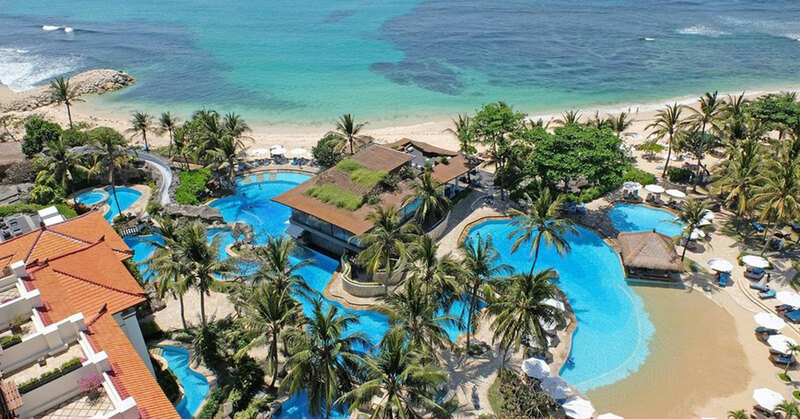 One of the most luxurious beach resorts in Nusa Dua, the elegant Hilton Bali Resort’s claim to fame are its incredible island and ocean views – perched at the top of a 40m cliff towering above a secluded white sand beach. 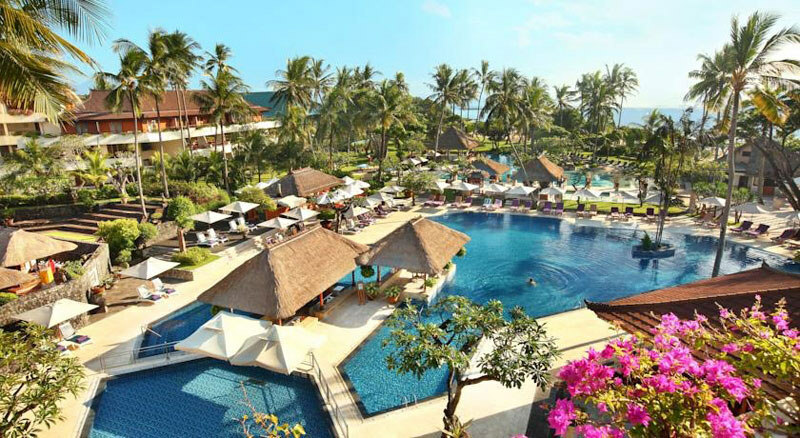 The sprawling, landscaped grounds of the Hilton Bali Resort encompass a jaw-dropping series of four interconnected pools, crisscrossed by gardens, sculptures and bridges. 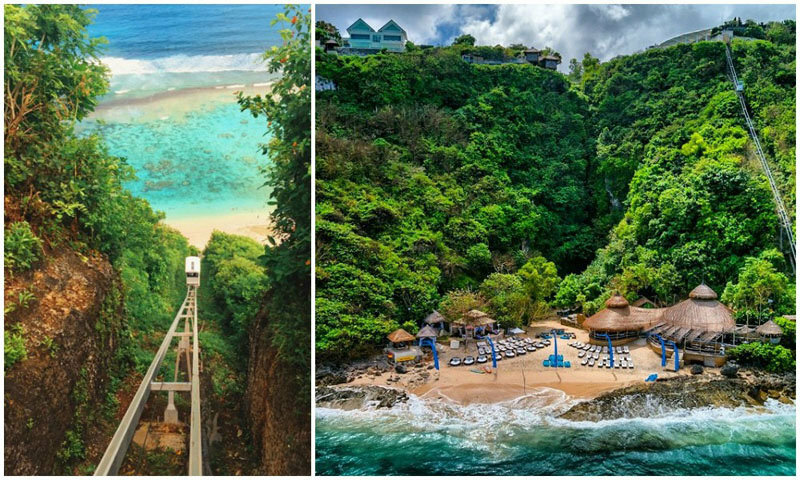 There’s also a separate children’s lagoon and a 30-metre water slide. 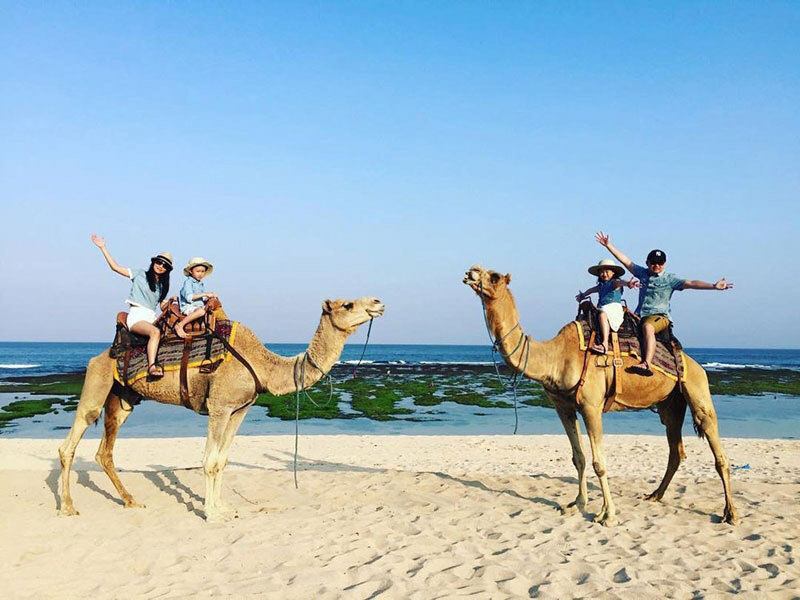 It also has one of Bali’s most unique beach activities: camel riding. 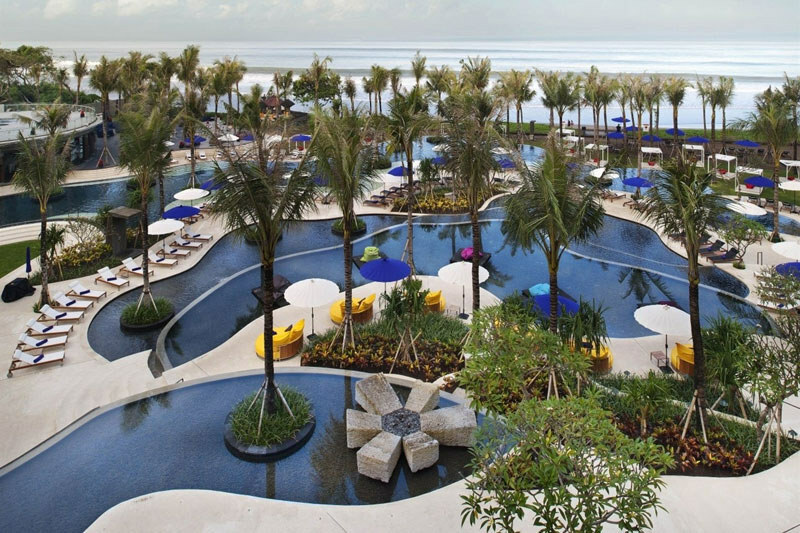 Hilton Bali Resort offers a special pass for non-hotel guests. 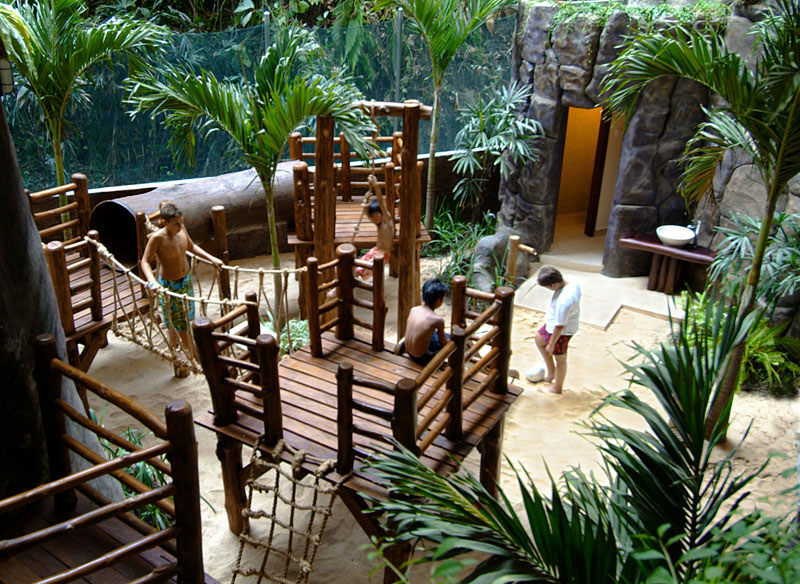 The pass costs Rp 450,000 (approximately USD $34) per adult. 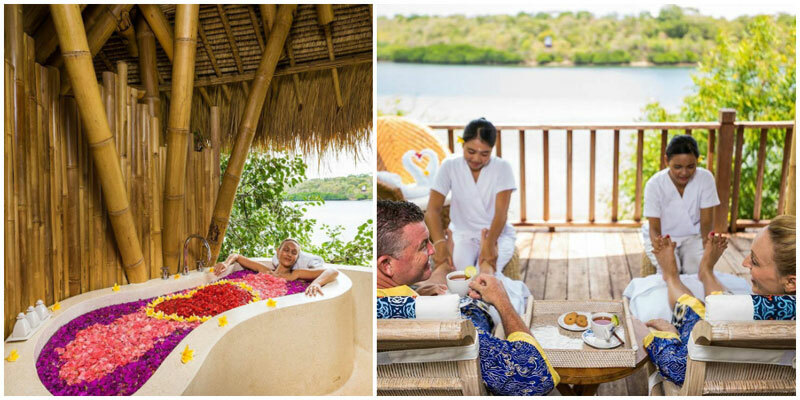 It gives you access to the resort’s pools and private beach, a complimentary towel per person, one hour access to the Jungle Camp Kids Club for children under 12, a 15% discount on food and beverages and a 25% discount on selected spa treatments at the Mandara Spa. 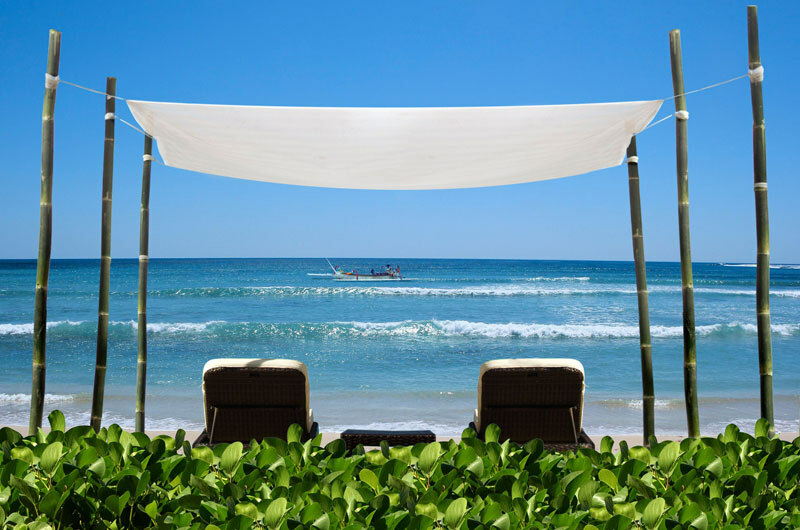 Also, if you spend a minimum of Rp 500.000 on food and beverage, you get a half day use of your own Cabana by the beach! Tip: To get your Day in Paradise, ask at the Tour Desk counter on arrival. Get your day pass at Rp 450,000 nett (approximately USD $14) for 1 adult. Kids 7 to 12 years old can purchase the day pass at half the original price, while children under 12 years old can enter free-of-charge. 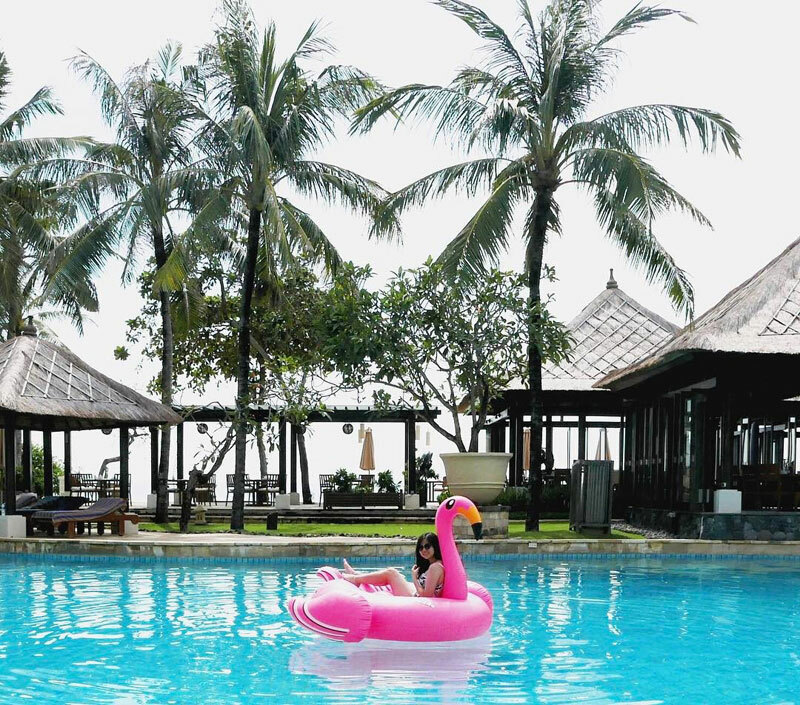 With its authentic architecture and furnishings, the long-established Nusa Dua Beach Hotel has gone for international luxury with a touch of tradition, taking inspiration from the royal palaces of Bali’s past. For pure relaxation, you’ll want to hit the Pool Bar, with mid-water seats letting you sip on a cocktail without leaving the cooling embrace of the pool. Day pass guests can visit the pool areas between 9am and 5pm. 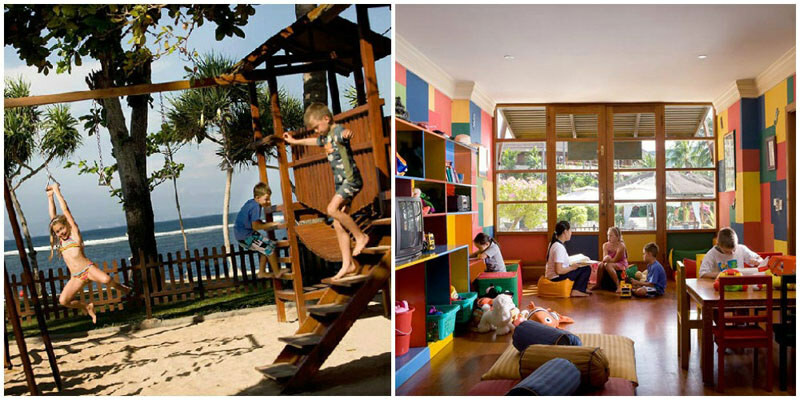 Ps: For parents looking for family-friendly amenities like the kids club where kids have a safe space to play and get creative while you steal some couple time, the kids’ club is available to you! 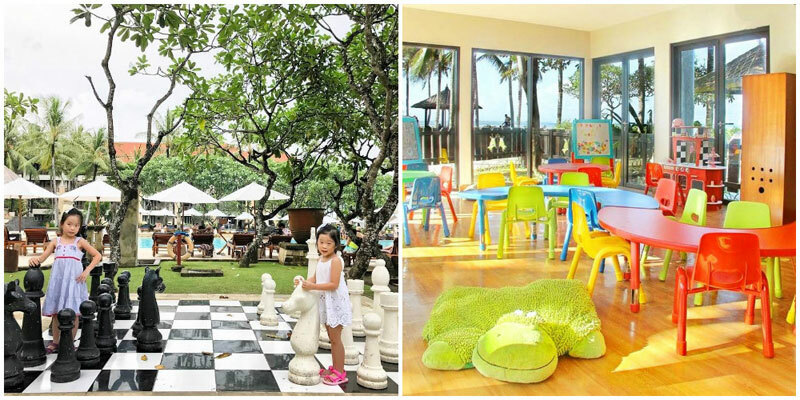 A day pass costs Rp300,000 (approximately USD $22) per adult (includes access to pool, gym and beach), and Rp200,000 (approximately USD $9) per child (includes access to kids’ club facilities). 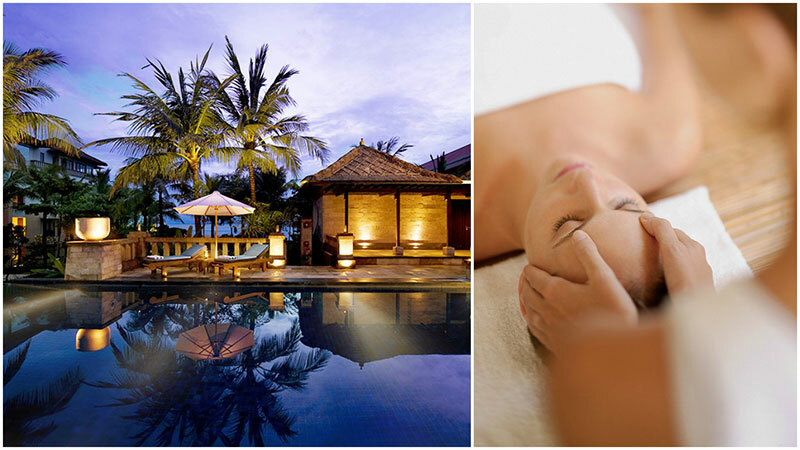 Pool can be used from 6am to 7pm, spa can be used from 6am to 10pm. 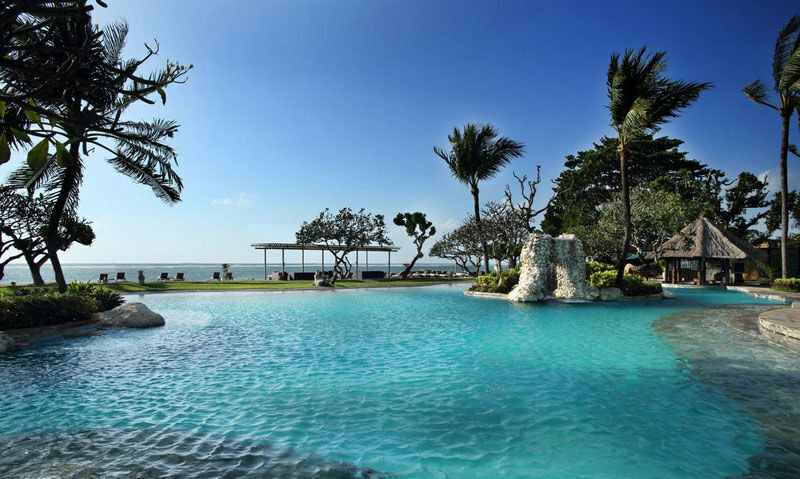 Renovated and rebranded in late 2013, the Hotel Nikko Bali Benoa Beach Resort is a chic 5-star resort in the prestigious Nusa Dua enclave facing Tanjung Benoa Beach. The resort boasts 127m direct beachfront access where a variety of water activities are offered for guests. The super-sized lagoon pool is a sight to behold, dotted with islands of palm trees and gazing out over a mesmerising blue sweep of ocean. 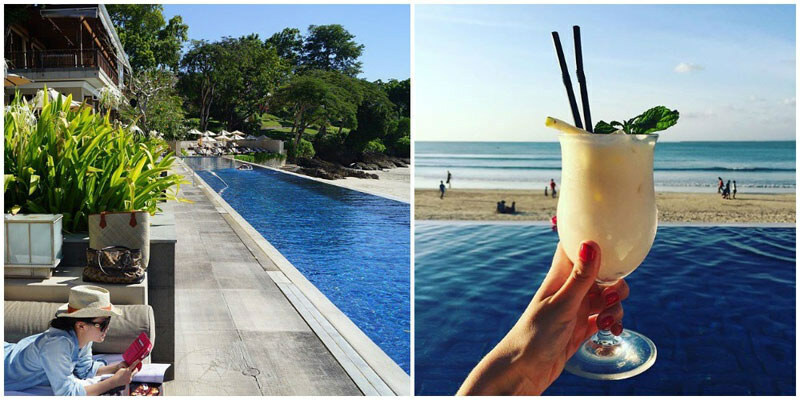 Paddle over to the Aloha Pool Bar for fresh juices, cold Bintangs, cocktails and mocktails. One day pass will give you free access to the pools, beach, fitness center, and steam room. You are also entitled to a complimentary pool towel, poolside nibbles (your choice of buffalo wings, spring rolls or French fries), and special guest prices at Biwana Spa! Get your day pass at Rp175,000++ (approximately USD $12.25) per adult and Rp125,000++ (approximately USD $9) per child 5 to 12 years old (free of charge for kids younger than 5 years old). You can use the facilities from 8am to 8pm. Perched above the Ayung River, the Alila lays claim to the most breathtakingly beautiful pool in Ubud. 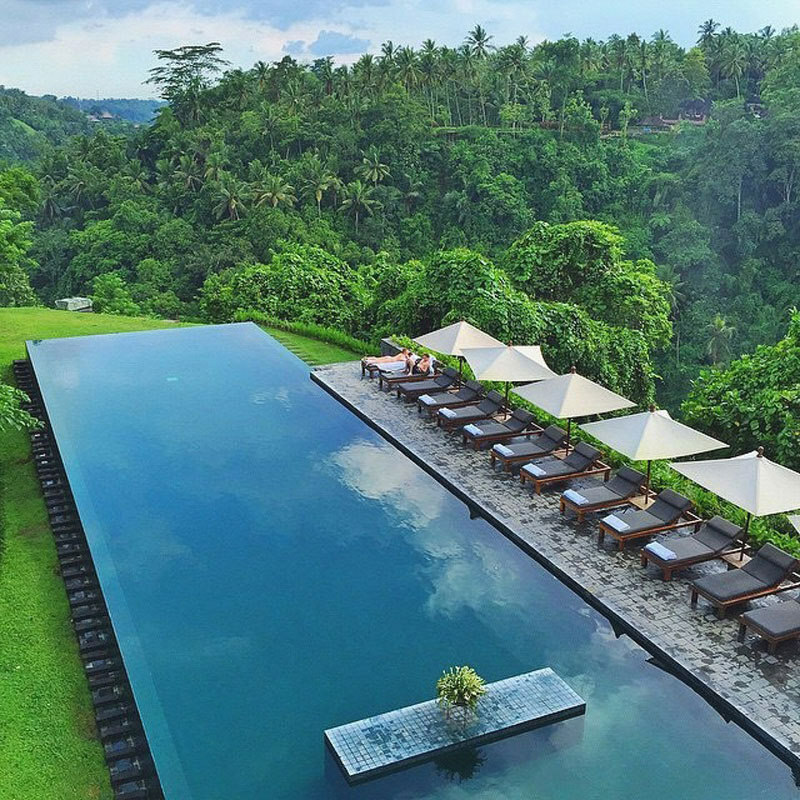 A sliver of an infinity edge pool which goes from an intoxicating emerald colour on Ubud’s misty mornings to sapphire blue in the afternoon sun, it gives the appearance of overhanging the plummeting valley below soaking up panoramic views of Ubud’s lush, forested hillsides. The Alila pool is generally a guests-only indulgence, but if you come here for an afternoon tea, you’ll be given a complimentary access to Alila’s world famous mountainside swimming spot. Try their ice cream desserts in tropical flavours! Tip: Pool access will be at the hotel’s discretion based on occupancy. Do note that access to Alila’s famous mountainside pool depends on the pool’s availability. Although the day pass at Karma beach club does not give you access to the main pool, but this beach club is too special to miss a mention. 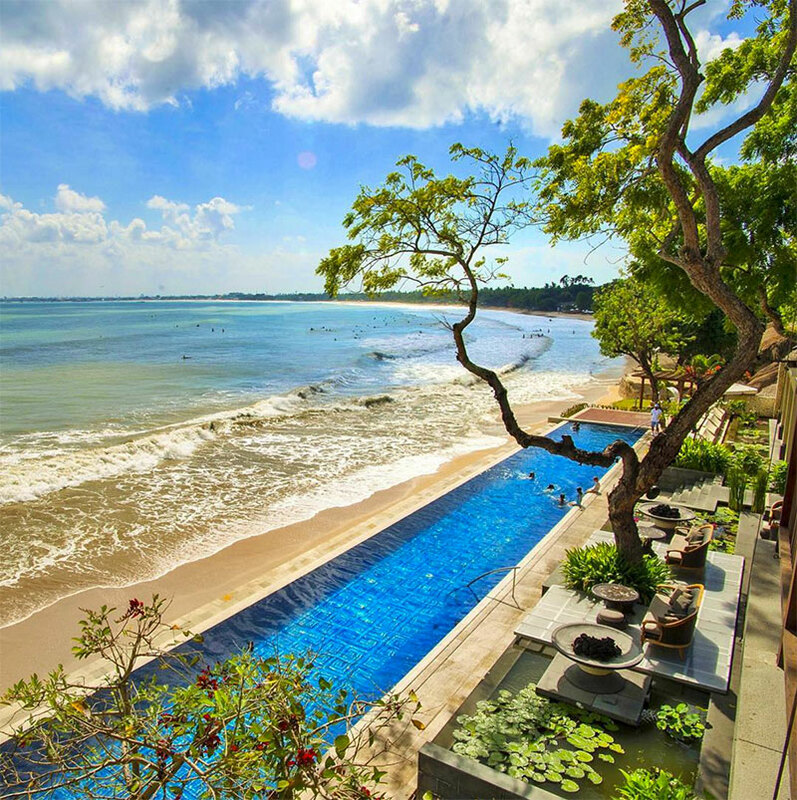 Karma Kandara sits pretty on the Bukit Peninsula on Bali’s southern coastline, also known as ‘Billionaires Row”. 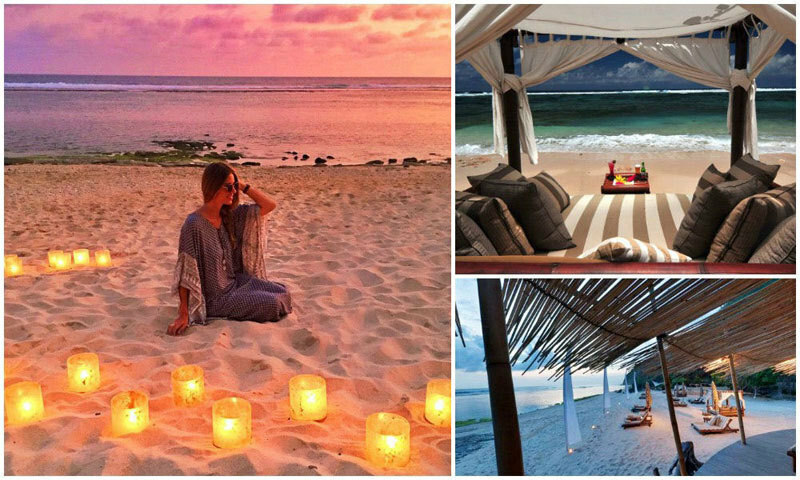 The picturesque Karma Beach Bali is a lovely stretch of white sand with a relaxed, exclusive atmosphere, fully serviced by the resort staff. High-flying guests opt for Kandara’s opulent private pool villas, but for the rest of us, there’s the dazzling Karma Beach, and the dreamy expanse of the Indian Ocean beyond. One of the best parts of day tripping at Karma Kandara, is taking their cable car down to Karma Beach! A fun way to reach your day’s destination, the kids will surely enjoy it. Once you’ve reached, you may use the facilities there, from the sun lounges and towels. There are DJs spinning which create a great party/uplifting tone to your holiday. Day trippers can make use of the resort’s kayaks and snorkelling equipment (with an additional fee). You may also use your day pass’ credit at Karma Beach Bali Restaurant. 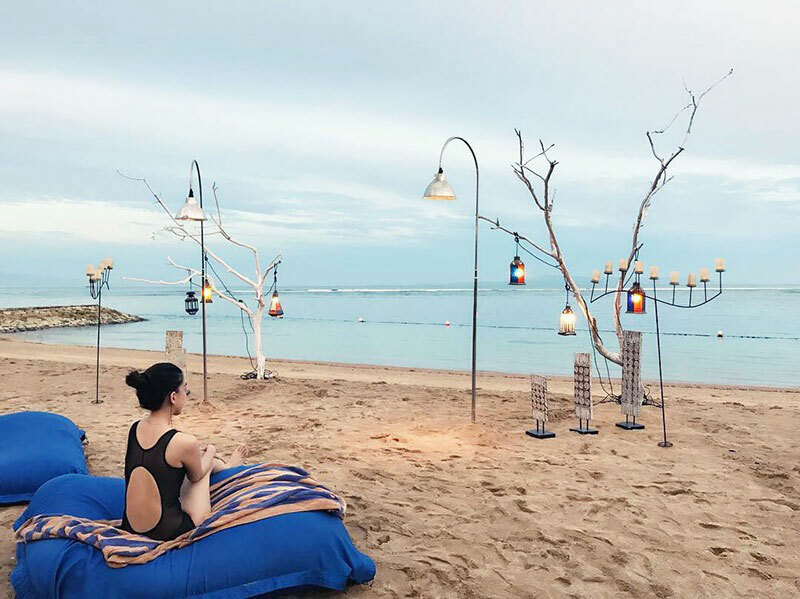 Apart from that, did you know the exclusive and oh-so-hidden Karma Beach regularly hosts the cosiest movie sessions at the beach? 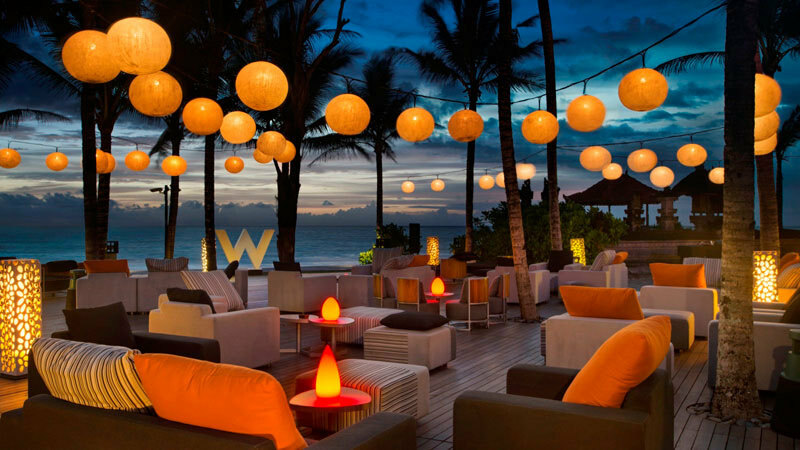 Imagine comfortably cuddling up to a movie screening on the beach with the setting sun and glowing lamps. It’ll be one of the most memorable experiences you’ll have. PS: Visit one of the most unique bars in Bali, right here at Karma Kandara. 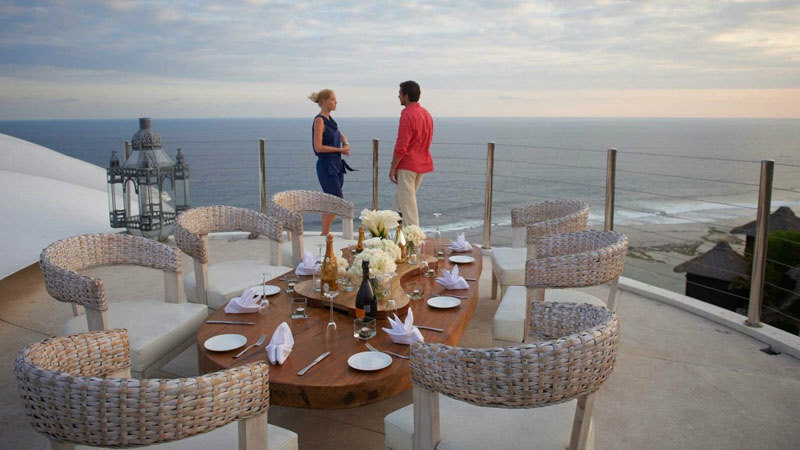 Introducing Temple Lounge & Bar, located on the rooftop of La Mare Restaurant, which also happens to be right on the cliff top! A day pass costs Rp 500,000 (approximately USD $37). 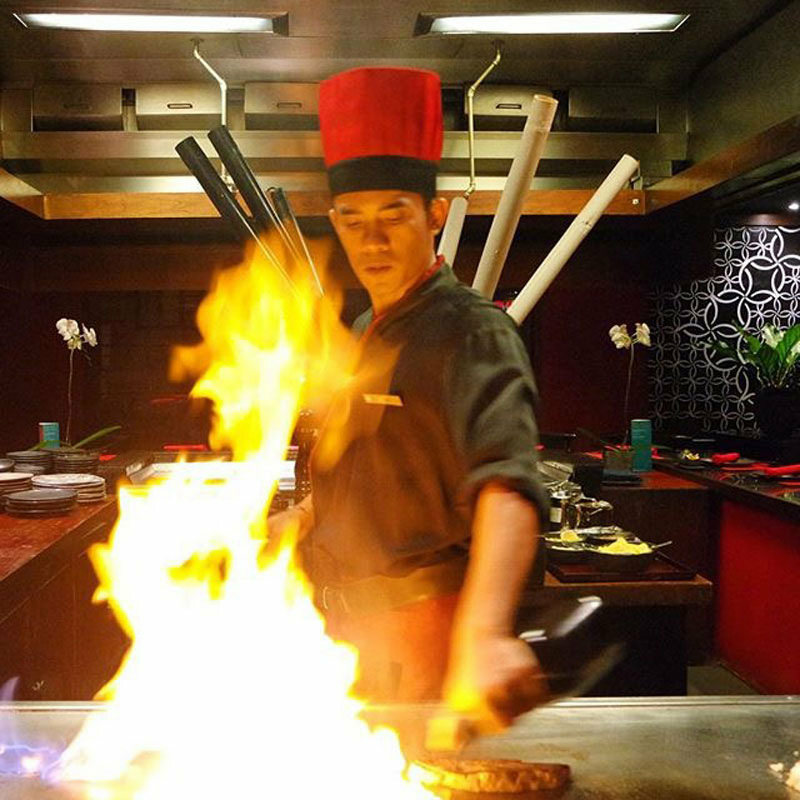 This includes Rp 300,000 (approximately USD $ 22) credit for your food and drinks! Free-of-charge for kids under 5 years old. 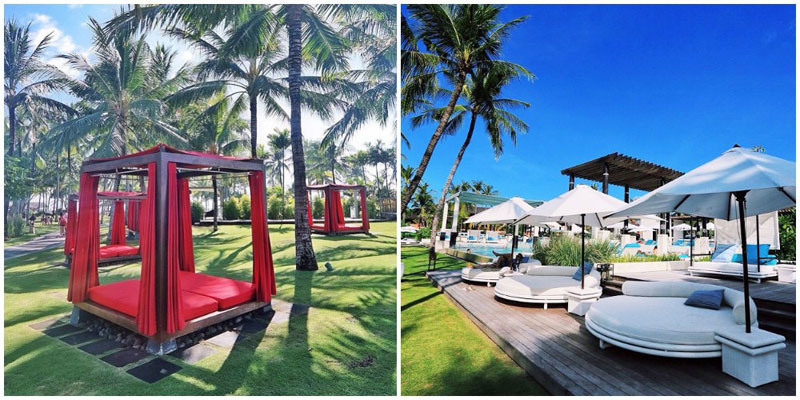 Are there any more luxury beach resort pools in Bali where you dip into on a day pass? Comment below to let us know! 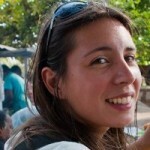 Fiona is a freelance writer based in Sydney, Australia. A fish in a former life, she spends as much time as possible near, in or under the ocean. As a traveller, she is endlessly curious, restless and seeks out transformative experiences Her penchant for adventure has taken her to remote corners of the globe, diving, trekking, riding motorcycles and sampling the world’s most weird and wonderful street food.